Summary. International scientific journal “Experimental Оncology” (Publishing House “MORION LLC”, Kyiv, Ukraine — R.E. Kavetsky Institute of Experimental Pathology, Oncology and Radiobiology of the NAS of Ukraine, Kyiv, Ukraine) earned high global recognition, receiving the prestigious international award “SCOPUS Awards Ukraine” as a winner in the category “The Best Journal”. 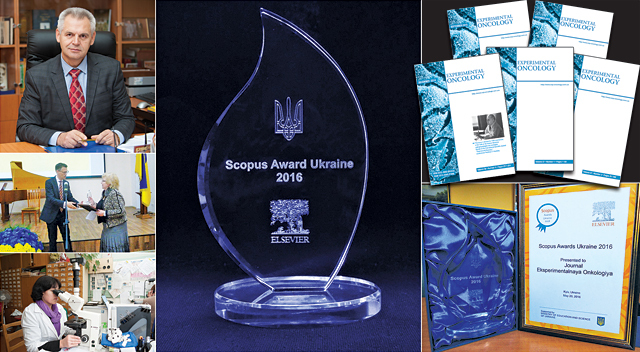 On May 20, 2016, during the celebration of Science Day in Ukraine, the first award ceremony of “SCOPUS Awards Ukraine”, established by “Else­vier” company and the Ministry of Education and Science of Ukraine, was held. “SCOPUS Awards” is a global initiative of “Elsevier” (world-leading provider of scientific, technical and me­di­cal information products and services, including well-known product SCOPUS), aims to encourage scientists for their research activity and science popularization. The contribution of scientists and scientific organizations into the global science was assessed according to the largest citation database of peer-reviewed scientific literature SCOPUS. The winners in 5 nominations were determined. In the category “The Best Journal” an international scientific journal “Experimental Oncology” has been nominated. Award ceremony SCOPUS Awards Ukraine gathered leading Ukrainian scientists, managers of leading scientific state institutions and officials, who are responsible for state policy in science and innovation, on the joint platform. Prize “SCOPUS Awards Ukraine” was presented by the Senior Vice President of Elsevier on Governmental Issues Michelle Coleman. International scientific journal “Experimental Оncology” was established by the National Academy of Sciences of Ukraine, R.E. Kavetsky Institute of Experimental Pathology, Oncology and Radiobiology. The first issue was published in 1979, since then the magazine is issued quarterly, and from 1998 on the platform of Specialized Publishing House “MORION LLC”. Editorial Board of the journal includes leading scientists from Ukraine, Belarus, Denmark, Italy, Japan, Lithuania, Russia, Sweden, USA. Editor-in-Chief V.F. Chekhun, the Academician of the NAS of Ukraine, Professor, MD, Honored Scientist of Ukraine, laureate of the State Prize of Ukraine in Science and Technology, winner of R.E. Kavetsky Prize of the NAS of Ukraine, Director (and Head of the Department of Cancer Monitoring and Therapy Design) of R.E. Kavetsky Institute of Experimental Pathology, Oncology and Radiobiology of the NAS of Ukraine. The journal “Experimental Оncology” publishes review articles, original research results and reports on basic and clinical aspects of the oncology in the areas of systems biology, cellular pathobiology, molecular oncology, immunology, biochemistry, biophysics, genetics, virology and epidemiology. Especially discussed are issues regarding the mechanisms of action of carcinogens and anticancer drugs, cancer prevention, epidemiology and ecology, analysis of the new diagnostic methods and treatment of cancer patients. An interesting fact: scientific journal “Experimental Oncology” received a prestigious international award “SCOPUS Awards Ukraine” as the winner in the category “The Best Journal” exactly one week before the XIII Congress of Oncologists and Radiologists of Ukraine opening in Kyiv. Let’s consider this symbolic coincidence as a sign that modern medical practice must owe for its effectiveness to the forefront of fundamental science.